Some have termed the new Nomos Ahoi a "Dive Watch"... but that's a fairly loose description for this smooth-bezeled model. I'll go instead for the Nomos description of "Sporty, robust, upbeat, modern" because this is a brand who know a thing or two about how to market their unique watches - a refreshing change from some press releases which are so far off the mark that one would need a pinch of realism and a dictionary in order to interpret them. 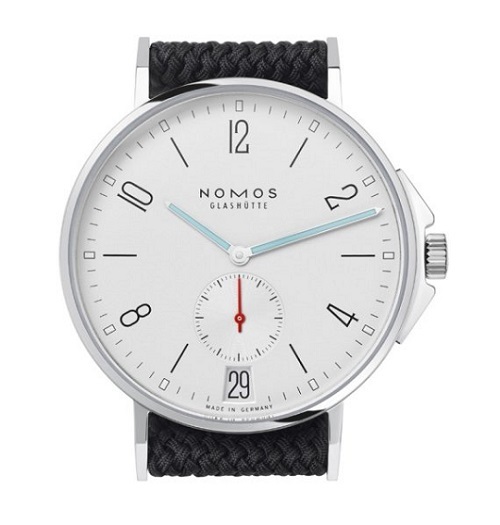 No repartee is necessary to endear potential customers to the Nomos portfolio - this company make some of the most uncluttered and beautifully designed watches available. Quality is of the utmost standard and each watch is made to meticulous Manufactory conditions. The Ahoi manages to place itself in the sports watch genre whilst maintaining the minimalism of the Tangomat dial on which it is based. The inclusion of a serrated-edge rotating bezel would be a ruinous addition for such a crisp design and so the trim edge of this case does not move. For water-based activities, the caseback and crown are screwed-down, safely sealing the calibre to a depth of up to 200 metres. A departure into the sports watch category creates a few unfamilar features. Crown guards mean a case-side destraction is necessary and the dial has some added colour, blue lume on the hour and minute hands and a red sub-seconds hand - hardly vivacious, but this is Nomos after all. The steel case measures 40mm and two editions will be available, an Epsilon Calibre-powered piece without date window and a Zeta Calibre version with date. More on the Nomos Ahoi and an insight into the Nomos principles of design at their meritorious website here. More Nomos from us here.